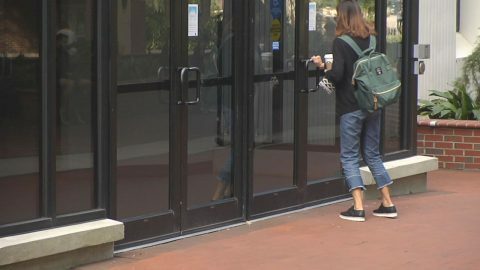 The book Unsafe on any Campus was released in July and details administrators inability to adequately deal with sexual assaults on campus, but as Mike Vasilinda tells us, the author now says their problem could be more difficult because of lewd remarks by Donald Trump. When the Washington Post released the video of Donald Trump making lewd remarks about women: “I moved on her #### but I couldn’t get there and she was married” Trump is heard to say on a decade old video. Sam Staley, the author of Unsafe on Any Campus was angry. “Eighteen to twenty percent of women will report, by the time they have graduated will report they have been sexually assaulted.They have actually experienced the things that Donald Trump is bragging about in that tape” says the author. Staley has spent years teaching women about self defense, and he says the Trump video only emboldens a corrupt, uncaring. demeaning treatment of women. “He seems completely unaware of how that kind of talk is contributing to a campus climate that supports sexual assault. And its very clear, and we actually have a lot of research that shows its these group attitudes about how they diminish the dignity and agency of women that really sets up an environment in which sexual assault happens”. The book advocates bystander intervention. Friends telling friends, back off. “Yes, the Donald has scored. (laughter) oh my man” was attributed to Billy Bush, cousin of former Governor Jeb Bush. (Bush was suspended from the Today show for the remarks). Making them co-owners of the remarks. “I can’t imagine that if those guys were talking about Trump’s daughter that way that he be anywhere near as calm or willing to justify their behavior, but it gets them off the hook” says Staley. The author says he is a libertarian and he is not voting for Trump or Clinton. When it comes to campus assaults, he said she said makes criminal prosecution difficult, so the the author says Colleges and Universities need other tools such as suspension when charges can’t be proven beyond a reasonable doubt.